Tycoons is a great name for a slots game that features some of the best and most technologically sophisticated 3D graphics, exciting sound effects, and surround sound soundtrack to guarantee maximum entertainment for gaming fans. BetSoft left no stone unturned when designing this slots offer.First-time players will be impressed by the Progressive Jackpot feature that all but guarantees that you will achieve a large payout even with lukewarm luck at your back. Whether you are looking for a lucrative game or an entertaining diversion or a solid combination of both, this slots game is the right choice for you. Tycoons has 30 paylines spread over a 5-reel set up plus many bonus features. The theme of the game includes several bonus icons and symbols that depict wealth, money, grandeur and a life of leisure representing global tycoons in action. There is also a rich sheik, a rich elderly widow an extremely wealthy businessman, gold bars, a champagne bottle, a Ferrari, a premium credit card, a roll of cash, and a fancy briefcase filled with cash, etc. The exaggerated characters that fill the interface are in a semi-cartoon motif. The reason I suspectis to make the game more like playing in a fantasy world as opposed to against “real” people, who some players may be inclined to say they recognize the character as a real person. As cartoon characters go, these are pleasing to the senses and are not overly stereotypical as I’ve seen with some games. The backdrop to the characters is a grand mansion with a huge fountain out front with a red Ferrari parked in the driveway. The Ferrari image contains the Maxbet shortcut button, which lets you place the maximum bet on all available paylines with the single push of a button instead of having to perform the task payline by payline and coin value by coin value, which would be tedious, indeed. The dashboard and all the other game controls, like the Line Selector, the Bet Selector, and the Spin button are located on the image of the fountain. Coin denominations are between NZD1 and NZD0.02 and the allowable bet range is NZD150 down to NZD0.02. A common feature of BetSoft slots is the 5 coins per payline rule, while the maximum bet is 150 coins on a payline. The Jackpot is seven thousand five hundred times your wager or a straight NZD7,500 if you are lucky enough to line up 5 Briefcase symbols on a single active payline. Unfortunately, Tycoons slots does not have any Wild or Multiplier symbols to help you make more money during base play, but it makes up for itwith many Bonus Rounds. The Free Spins Bonus has an Expanding Wild that swells to consume any other symbols on the same payline without you ever having to bet any money. There are three Bonus features in the Tycoons slots game. They are the Click Me Bonus, the “Fs” Free Spins and the Poker Bonus game. The Free Spins feature is activated when you get 3 or more Tycoon symbols marked “Fs” to the right side of the reels. If either of those icons lands on either reel 4, 3, or 2 they trigger the Expanding Wild, which enhances the player’s odds of getting a winning combination caused by the Expanding Wild. If the expanding icon successfully creates a winning combination during the Free Bonus Spins, the bet is doubled. A combination of three icons in this specific order — Gold Bars, roll Of Cash, and The Checkbook — will activate the Click Me Bonus feature.These three symbols appearing together morph into the Click Me Bonus feature and you will be prompted to click on one of your choices and your Instant Credit reward will be revealed to you. No slots game should be deemed to be legitimate unless it houses the phenomenal Poker Game Bonus feature, and Tycoons slots does. Here, the four Tycoons are actually playing a game of poker. Your challenge is to select the one who is going to win the poker round, and if you choose correctly, you will get a bounty of coins at the end of their game of poker. This bonus round is triggered when you get at least three symbols of a dealer’s hand holding a poker card. The bonus round is a bit slow but it is one that offers the biggest payout to the player. As you can see, Tycoons with its great graphics, multiple Bonus,and jackpot round is worthy of most gamers’ attention. The game is compatible with browsers like Microsoft’s Edge, Internet Explorer, Google’s Chrome, Otello’s Operaand Mozilla’s Firefox. 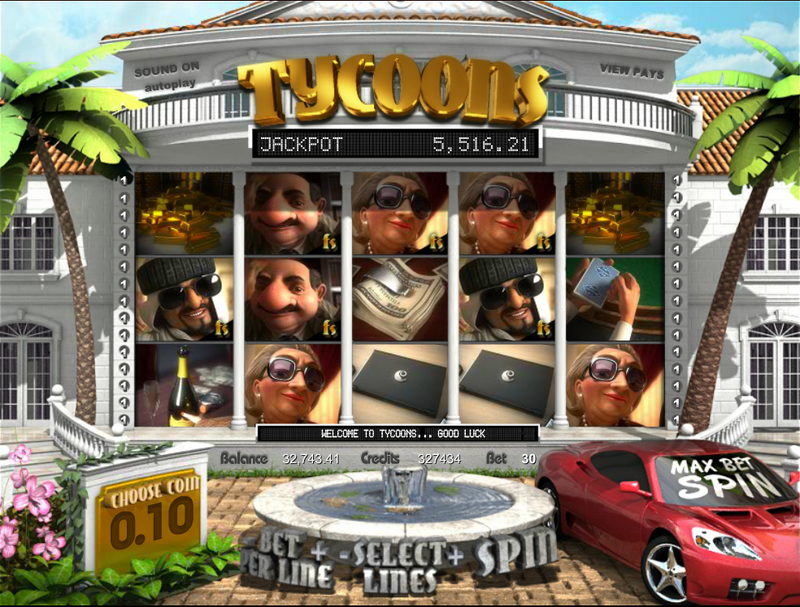 However, this 3D Tycoons slot game is not yet mobile ready and therefore the only place you can play it is online.